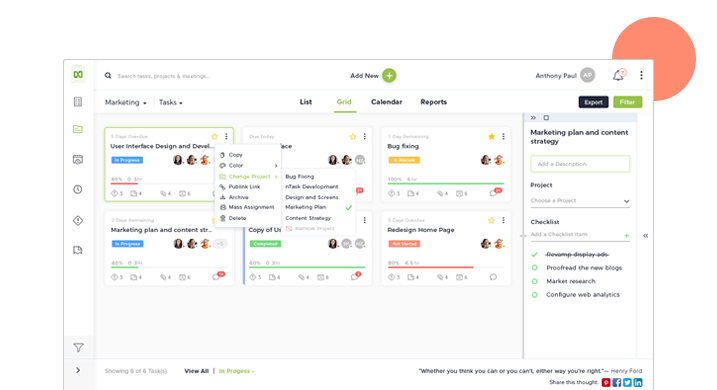 Every organization and business needs a good project management tool to make work more efficient and collaboration more effective. According to research by Capterra, a project management software is the most needed software by nearly half of the U.S. However, it cannot be a “one size fits all” solution. Which means that the adoption of the right tool depends on requirements such as the pattern of work processes, organization size, projects type and a lot more factors. There are basic features, nevertheless, that must be present in a good project management tool. Here are features as per a study by Software Advice that you should not miss out on when making your pick. Designing and creating software products is an intensive process that rotates between development and bug fixing before release. In other industries, project issues can comprise missing information, policy change or errored records. For effective project management, it is important to be able to identify, highlight and manage such bugs or issues. Keeping track of issues and their resolution keeps project maintenance under control, which can otherwise spiral out of control. Choose a tool that has an efficient issue management module. It makes projects more streamlined without extra time consumption chasing the same errors repeatedly. An efficient project management tool should be able to facilitate task management from basic to a professional level. Tasks may need to be sorted and managed independently or as a part of a project. Either way, a project management tool should be flexible to cater to all requirements related to tasks. This can include creating, managing, organizing, assigning and tracking tasks. Tasks also need to be organized and prioritized in different stages of project development cycle. Documentation is an inherent part of project management. Whether it is company policies, project requirements, customer feedback or project updates, it is important that every element of the project development cycle be recorded and documented. Hence, an efficient project management tool should serve document management. Which means, it should provide enough options to create, manage and store documentation for regular feedback as well as later referrals. This can be in the form of comments or even file exchange. Team collaboration is key to project management. A worthy project management application must be designed and created towards working for and improving team collaboration. The project management tool adopted must be able to let the user work on a simplified interface for collaboration. Be it file exchange, employee feedback or even project updates, employees should be able to communicate timely information, effortlessly. If not, it can lead to communication barriers and ultimately impacts the projects. Did you know that 57 percent of projects fail due to a breakdown in communication? An efficient collaboration channel is a key element to look for in a task management platform. Projects need to be tracked. This can be done either with all of the activities or via individual activity in the process. This is important so that the time spent on each task can be calculated and the project timeframe, as well as expenses, can be monitored. Another reason to track projects is to measure employee performance. 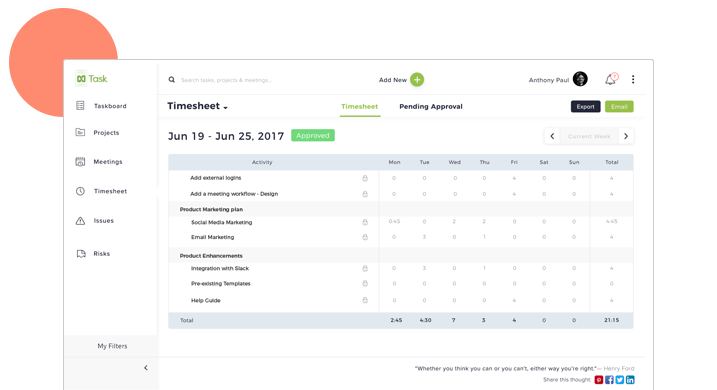 Time tracking helps calculate the time utilized by resources on individual tasks and to calculate payroll based on the hours worked. Project planning requires assessing the budget, resources, scope, and timeline for individual projects. Effective planning ensures a more structured approach to meeting goals. Unfortunately, 49% of IT projects are either poorly planned, poorly performing or both. The project management application you choose should help you pace your work as required. Flexibility is key, which means the tool should have enough options to modify and upscale or downscale the project depending on the need. There are various ways of managing projects progress. Some tools help generate project reports and others provide more sophisticated options such as Gantt Charts or Progress Meter Tracking. Gantt Charts provide a pictorial view of the project progress with necessary information updates. With a Progress Meter, you can have a look at the project timeline with the amount of work completed as a percentage of the entire project. 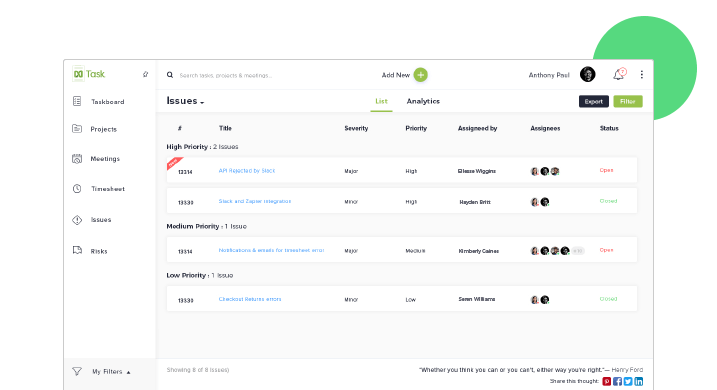 Either way, your project management tool should display enough options for selecting how your team views and manages progress reports. 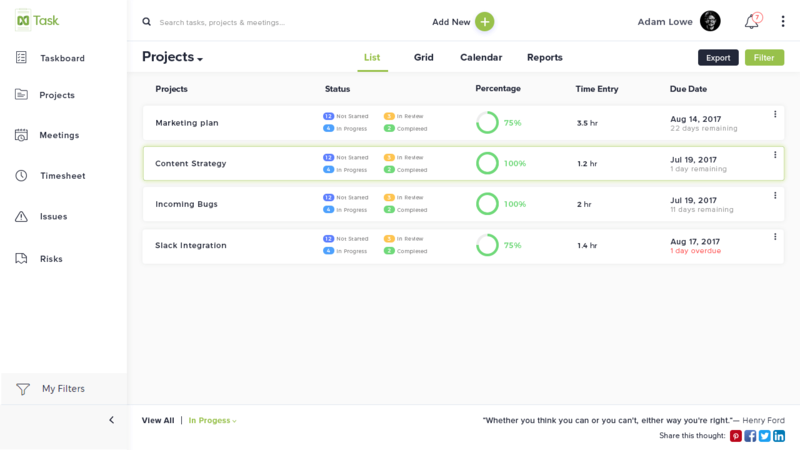 Considering the above factors, the one project management tool that you can look into is nTask. nTask is a complete project management solution with multiple modules on one platform. These modules cover project management, meeting management as well, issue and risk management and more. This online project management tool holds all the functionalities/features mentioned above. It gives you a sophisticated tool with an easy-to-use interface so you can streamline work and track it.